I checked my bees today. Just looking for conditions of supers. Several of my hives have four supers on them a couple have five. A few have two with nothing going on in the supers. These hives must have swarmed. Most of my hives were packages this year. The best producing colonies are the overwintered colonies. Bees have a hoarding instinct. Keep ahead of the bees with empty supers. If there is an empty box on the hive the bees will try to fill it. If the bees fill up the supers and the nectar flow is still going on, they may just stop collecting nectar. Because there in no where to put it. If you pull off partially full supers at the end of the season you can say you got everthing the bees could collect. If all the supers are full when you pull them off a hive, you probably could have gotten more honey. 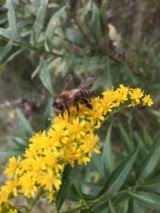 At this time the nectar flow is still going on. Driving around Stillwater, I have seen a new batch of White Sweet Clover starting to bloom. 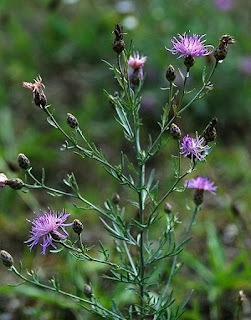 Spotted Knapweed is also blooming around the Stillwater area as I am sure it is blooming across the metro area. Spotted Knapweed is a noxious weed that should not be propagated. But the weed does produce some nice honey. 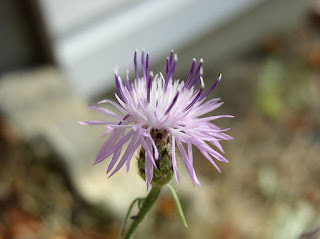 Spotted Knapweed can be confused with Thistle, but on close inspection it easy to tell the difference. 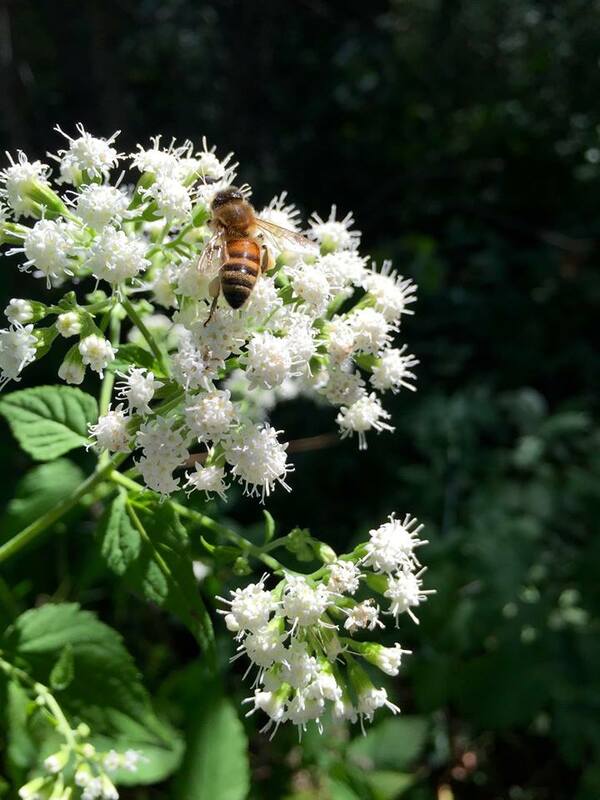 The Metropolitan Mosquito Control District (MMCD) is asking bee keepers to let them know where their hives are located so they can mark them on field maps and avoid them when treating for adult mosquitoes. MMCD is aware that beekeepers sometimes move their hives to more productive locations, so they’re asking beekeepers to keep in touch. MMCD will work to avoid your hives regardless of where you place them. This nectar flow has started off very spotty. It seems a lot of nectar came in early. There then seemed like a dearth of nectar for about two weeks and now it seems there is nectar coming in again. 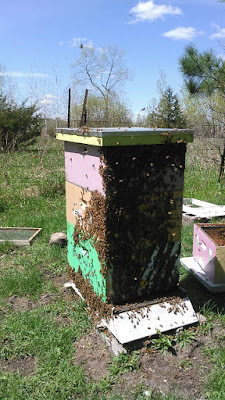 Overwintered hives were able to take advantage the early nectar. Many of those beekeepers have three supers full of honey or more. 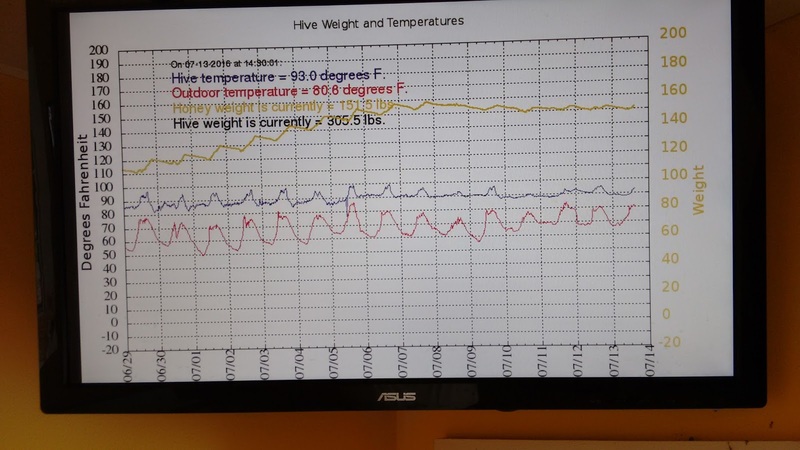 Package bees have about reached their full strength in colony population. Some beekeepers with packages have honey starting to get put up in the supers. So weather permitting, that will continue. Some hot weather would help. It has been dry, my grass is turning brown. Actually the dry weather can be good for the nectar flow. 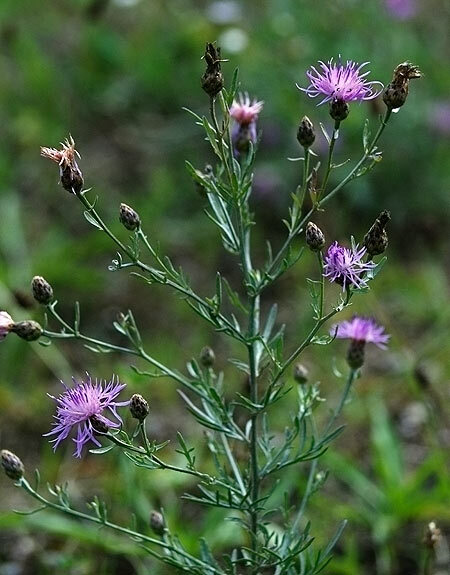 When it is on the dry side, it seems that plants secrete more nectar. We don't want it to get too dry and the plants start getting crispy. There is rain on the horizon so hopefully we won't get to crispy stage. Basswood tree nectar flow is still going on in rural areas. In any cities around the area I think it has run its course. The Basswood flow is a very fickle flow. Sometimes they secrete tremendous amounts of nectar, sometimes there is nothing to be had. Many plants and flowers are blooming now. Sumac, Thistle, Birdsfoot Trefoil, Clovers. Perennial Wildflowers are now starting to make their appearance. The first cutting of Alfalfa/Clover hay fields was in early June. We are now getting close to when the Alfalfa/Clover will be blooming again. 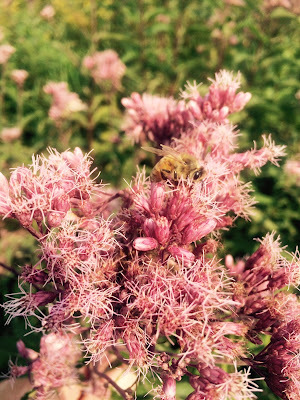 The second cutting of hay produces better nectar yields than when it first bloomed in June. The bees will fill their top deep full of honey first. This will be their winter honey. Do not do a reversal and put the heavy top box on the bottom. The heaviest brood box stays on top of the colony. If you are not getting any honey you could be in a poor nectar area, your bees could have swarmed, a poor laying queen has not produced enough brood, or the nectar flow at the moment is not great. I do have beekeepers who in their area, honey comes in early for some of them or late in other cases. That is when their nectar flows happen. 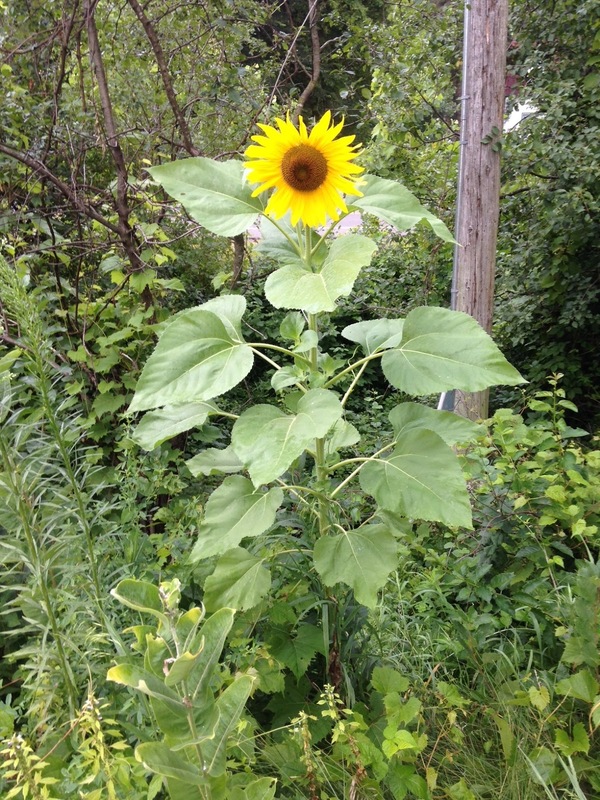 It can be soil types or just the general make up of flowers in their area. If your beeyard produces poorly after several years of trying, sometimes moving the yard three to five miles away can lead to better results. So right now flowers are blooming everywhere, summer is here, the bees are working. Keep ahead of your supers, check them weekly. Supers can fill up very quickly when everything is going right. If you have never been to the Gettysburg Battlefield I strongly encourage the trip. On this day in 1863, the 1st Minnesota saved the Battle of Gettysburg to help make a union victory. The Confederates were about to cut the Union line in half. The 1st Minnesota was ordered to take the colors of the attacking Confederates. 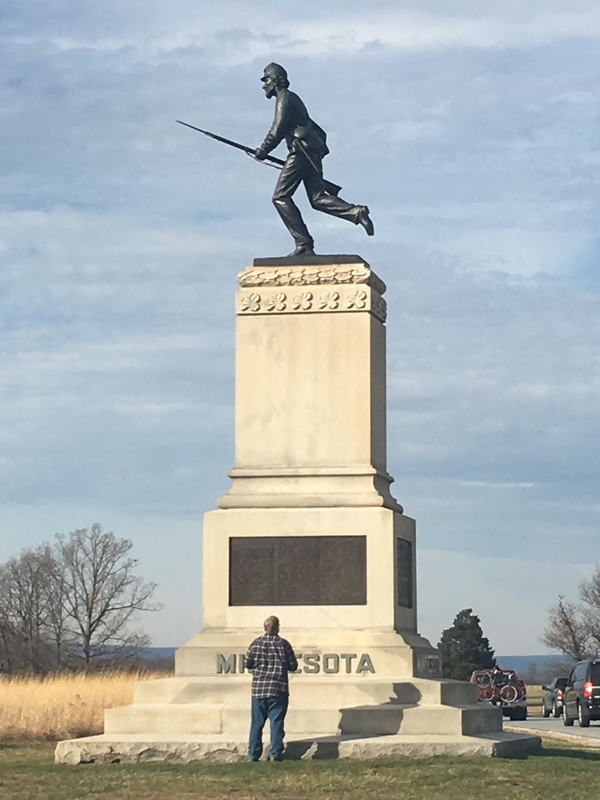 The Union commanders needed five minutes to bring up reinforcements, the 1st Minnesota gave him 10. Without any hesitation, 257 Minnesotans charged the oncoming 1,300 - 1,500 Alabamans. The 1st MN suffered an 82% casualty rate. It is the highest casualty rate of any U.S. military command in combat. I believe that is still true to this day. of the 257 Minnesotans that took the field that day, 215 were killed or wounded, 42 were still in line at the end of the day. 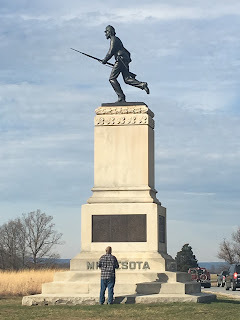 The following day what was left of the 1st Minnesota was on the front line for Picketts charge. The 1st Minnesota captured a Confederate battle flag that day and that flag is still at the MN Historical Society. Several groups of Virginians have threatened to sue to get the battle flag back, but the flag still remains in Minnesota.